From New York to Hawaii, on airport and off, National Turbine vacuum systems are in use at car rental facilities around the country. These quiet, reliable, low-maintenance systems provide high flows for faster cleaning and rapid car turn around, saving man hours and improving efficiency. From 2 operators to consolidated airport facilities with 100 or more operators, we have the complete system to meet any need. Our specially designed dual wall vacuum hose gives superior service in car rental duty, with improved crush resistance and resistance to wear through from abrasion on concrete and tarvia surfaces, plus static resistance for safer use around fueling facilities. Add a complete line of vacuum tools, tubing, and fittings and free system sizing and layout assistance, and it becomes clear why National Turbine is your one-stop supplier of all your system needs. Have a Lamson™, Hoffman™, Spencer ™, or other manufacturer's system? Our hoses and tools fit any system, and we stock filter bags and replacement gaskets for Lamson™ tanks. 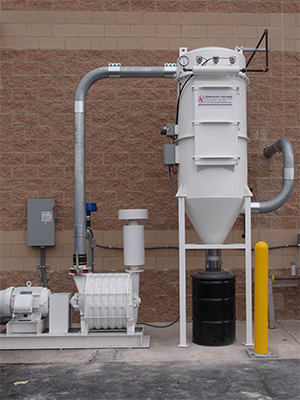 Our filter facility can manufacture any filter bag from your sample at very competitive prices. Hoffman, Lamson, and Gardner Denver are registered trademarks of Gardner Denver, Inc. There is no association between National Turbine Corporation and Gardner Denver. HSI is a registered trademark of Atlas Copco.